The products could be used on bellows-type cut off valve, bellows-type gate valve and bellows-type regulating valve. 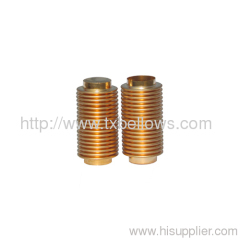 The bellows are designed to withstand external pressure, and the design pressure class is one and a half times of that of nominal pressure class. The design movement ( compression ) is larger than the minimum movement while turning on the valve . The cycle life is over 10000 cycles under nominal pressure and movement. We could design and produce the bellows and bellows assemblies with flanges according to the requirement from the customers.